It's a common question but what makes a successful entrepreneur? Of course, this question starts a whole conversation about the definition of success. It's my belief that success isn't just about making money. Most people start a business for the freedom they expect it to give to them. The cold hard reality is that most entrepreneurs end up working longer hours and for a lot less than a typical wage. Why would any sane person work for less money, work much longer hours and have way less freedom than they probably had in a day job? The reason is they have a much bigger vision for their future than the average person. So why if someone works harder than an average worker then why doesn't every entrepreneur become massively successful? What is the secret that helps the budding entrepreneur become successful? It's probably a clique but there is a formula to it. The challenge is that there are plenty of mad scientists out there selling you their secret formula. Often it really only works for them or a few followers. Why? Because they probably got lucky along the way. There are no real shortcuts to success, of course, there are exceptions to the rule. It's call luck or being at the right place at the right time. But often even the overnight success stories actually have a hard-luck backstory and years of failure and frustration. This book is about the process, strategy and implementation of your ideas. 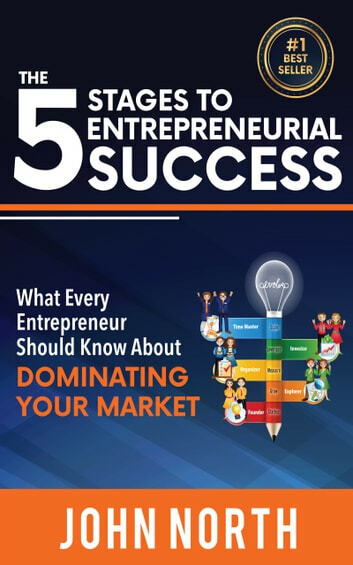 The 5 stages are our way of showing you a viable success path and will help you understand the mindset you need to develop to achieve your definition of success. You may be tempted to diagnose yourself at one stage and skip the stages prior. The reality is that often problems and challenges occur due to lack of fundamentals.